We ship World-Wide so the Finest Cacao can be shared around the world! 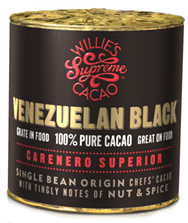 From the Venezuelan Black Range - From bean to cuisine. Everyone's affordable luxury. Selected from the finest cacao regions in Venezuela, these beans are traditionally roasted in our chocolate factory in England to bring you the indivual and exotic flavours in a 100% sold cacao bar. A Venezuelan Black Range - From bean to cuisine. Everyone's affordable luxury. Selected from the finest cacao regions in Venezuela, these beans are traditionally roasted in our chocolate factory in England to bring you the indivual and exotic flavours in a 100% sold cacao bar. Grown in the Departamento de San Martin Peru, this single origin cacao has been carefully roasted in our factory in Devon using traditional methods to capture the bean's subtle note of fruit liquor. Its characteristics change with each harvest - Like Wine! 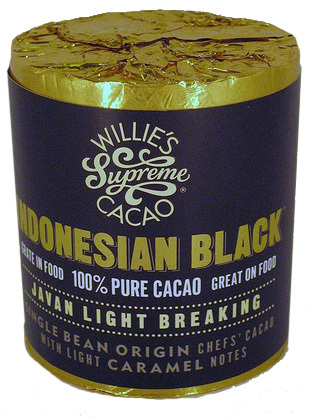 Dark Chocolate - contains cocoa solid ( 70% Minimum). Ingredients : Cocoa Mass , Cocoa Butter, Cuban Raw Cane Sugar. An eccentric entrepreneur with a mission to educate the British public in the delights of top quality chocolate, Willie Harcourt-Cooze, the star of Willie`s Wonky Chocolate Factory reveals how to use the ultimate luxury ingredient in a collection of 60 recipes. 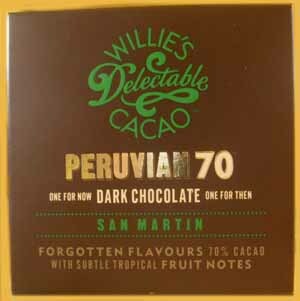 Willies Chocolate factory cook book tells the story of how Willie came to grow his own cacao beans in the Cloud Mountains of Venezuela and now turns it into his exquisite chocolate at his hand-built factory in Devon. 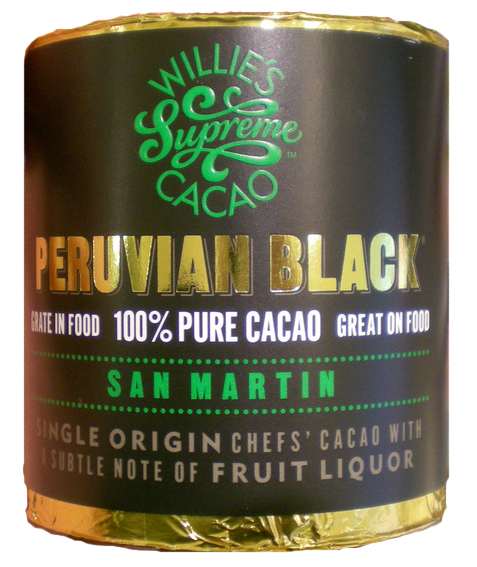 An ingredient in its own right, Willie shows how much 100% cacao chocolate can enhance an astonishing range of sweet and savoury dishes from Cloud Forest Chocolate Cake and Black Beans and Arepas, to Venezuelan Hot Chocolate and Chicken Mole. With stunning photography and mouth-watering recipes, Willies Chocolate factory cook book is perfect for all food-lovers. 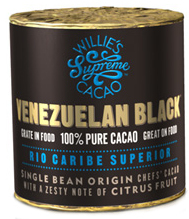 Selected from the finest cocao regions in Venezuela, these beautiful beans are carefully roasted in Willie's Chocolate factory in England using antique 100-year-old chocolate making machinery. The beans are then crafted into fine dark chocolate - made the way chocolate used to be ( maximum taste from minimum meddling). Venezuelan 72 unleashes long forgotten flavours, in two temping delicate and delectable squares. One for now ... one for then. Love your programme. Am ordering some chocolate. Would love to have your recipes but they are not on your web site – am sure they would help promote sales – why not sell videos or have clips from the TV show on your web site or even downloadable PDFs of your recipes? Just ordered my first bar & looking forward to some interesting recipe creations ! Roast some more beans please!! Inspired by TV programme…please let us know when stocks are available again. Great show on tv, i think your an absolute insparation. I cant wait to get my hands on some of your chocolate, which one do you recomend to use for drinking ? More importantly, where can i get some ? Hi, Will you be releasing a book with receipes anytime? I still haven’t been able to track down that semi-freddo receipe that Willie did in one of the episodes! Your recipes all give weights of how much to use, but on the details on you ’shop’ pages no weights are shown – how much does each bar weigh? And with the recipes would you recommend a particular ‘hint’ of flavour. IE which bar would you use for the could cake or brownies for example? …Just realised I am being very thick regarding weights…..sorry! But still interested to know which bar you would suggest for cloud cake and brownines? I was thinking about getting my dad some as part of his 50th birthday hamper. What one would you suggest? I think he would like to use it more in savoury cuisine as oppose to sweet (though both will probably happen). I agree with admin regarding the Carenero Superior – Nut and Spice. I used it to make the cloud forest cake and wow what a cake! Hi there, I would like to buy and try the choco, I am not sure though if you still produce it. I read you are selling a chocolate bar and there is a waiting list for it, I can’t find this on your website? Will you be stocking more of the “Hacienda El Tesoro – Berry Fruit”? I really want to try it! Thanks for sending out the message of how real chocolate shoukd taste like. I won’t eat cadbury’s anymore only the real thing. Tried the dark chocolate/almond cake with the truffle ‘icing’. We loved it, Very rich and sustaining — all our houseguests over Easter break raved about it. tasted better on the second day — although not much left! Well done, Willie — it’s great to see some passion in someone come to success. You deserve it! I will be buying your recipe book over amazon very soon! I adore the honest taste of genuine cacao beans in your chocolate, the pride you take over making the product is apparent in the quality. I won’t settle for anything less anymore so i hope you continue to make your chocolate and more because any new products will be bought as soon as available, by yours truly! Hi.. do you ship to Australia.? any thoughts of distributing your chocolate Down Under..? Congrats on your success..! Your documentary has just started airing in Brunei Darussalam! Love the show. I’m definitely buying your book. Best of luck! PLEASE tell me you plan to sell Venezuela Black in Singapore!!! Any plans to sell in Australia soon? I really enjoyed the series, bought the book, now need the chocolate and am hassling Lifestyle Channel to show the next series down here soon! I’ve been watching your show and I suddenly find myself adding chocolate to just about every dish – and I am really not a chocoholic!! When can we get Venezuelan Black in South Africa? Love your programme, of course we are very behind and only just had the first series. Just had wild boar, chocolate and chilli sausage, fantastic. Think you would love it. Will have to come to Cape Town for it though! Where can i buy your retail products around the yorkshire area.your program had me drooling as i am someone who adores dark chocolate. Every successes to you. i love the show i watch it all the time and find it great i love it!!! Saw your program and am interested in your products! Do you have chocolate products suitable for a diabetic? Hey man, would like to try your coca, yes we here in oss have just been watching your adventures with the coca bean. Very interesting:) Well done man an inspiration to us on our sofas!!!! Hey your tv programme has reached New Zealand and my family and extended family are hooked…I’ve ben trying to tell them for a long time that the only chocolate worth eating is dark and high % cacao. I will be buying some of yours for sure – keep up the awesome work!!! Watched your show on Tv. Great show! When will it be available in Malaysia? Any suggestions on how to get hold of the bars now? Hi, I am a big fan of chocolate! And just watched your programme in Hong Kong! Would like to order your chocolate online, or do you have any sales points in Hong Kong? I can see your heart = your love with chocolate!! Your programme is airing in Malaysia currently (Mar 2010) but is (I think) some 2 years old. Have you produced a (non cooking) bar of chocolate? Hey Willy (and family), I watch your programme in Singapore, you’re truly an inspiration mate. Sure hope you sell them over here very soon! Venezuelan 72 – Rio Carbe Bars are Non cooking straight eating! Im from South Africa and I looove your programme!! Been following it religiosly and shared all the different emtions with you. Im so happy that the choclate is such a success! Well done. Good luck and i hope all your dreams are realised. Where and how can i get the choc slimming drink?? I love watching your series I hope it will last forever! Hi Willy I recently saw your show when it was posted on Channel 4’s 4OD section. I was very impressed with your endeavour and support your efforts. How is the business going since the show finished? I will probably buy some of your chocolate very soon and hope to see how they taste. Keep up the good work. Just finished watching your documentary in Australia for the first time. Love the story and am dying to try some chocolate. I will order some in soon. Just saw a doco about you on Aussie TV here in my home town, Melbourne, Victoria, Australia. Where can I purchase your cacao in Australia? Or should I become your Aussie distributor? Blessings to you and your family for sticking together through the tough times. The good days don’t last, but neither do the bad. Interested in buying your chocolate bars. Any selling points in Australia? Loved your program and can’t wait to try some chocolate. Hi Willy, I have just seen tv programme on BBC Lifestyle and I am impressed! Wow! Fingers crossed for you! Do you how much is the shipping to Poland? I would like to buy some of your chocolate! Just watched your program in Perth, Western Australia and seen one of your other program before. What is your final goal with this unique product ? I thought the best way of promoting is as you did at the farmers market by making a finished end product, although the 100% chocolate cylinder bar has its own market, did you ever consider going into full production by selling cakes and all the other cake recipes you’ve created over the years to offer this to the public and other commercial enterprises ? I personally think the full potential lies in your own creations locally but your bars could also be sold overseas, is there a use by or best before date required ? I think that chocolate should be in the 'nice' box.